Welcome to Columbia, a fantastic floating city designed as a symbol of American Exceptionalism and national pride. That was before the Boxer Rebellion, when the city fired on innocent people. Columbia has since been disavowed by America, and become a symbol of xenophobia and hatred, a flying bogeyman dreaded around the world. Columbia is now being run by the Founders, a group of self-appointed rulers, nationalist and religious zealots bent on keeping Columbia 'pure'. But opposing them are the Vox Populi, a rag-tag resistance movement hoping to overthrow the Founders and restore all rights to all the citizens of Columbia. Thrown into this turmoil, you take on the role of Booker Dewitt, a disgraced ex-Pinkerton agent taking on a job that will clear you of "old debts" and maybe restore your name and reputation. The job? Journey into Columbia, rescue a girl named Elizabeth from the tower she's been held in for 12 years and return her to New York. 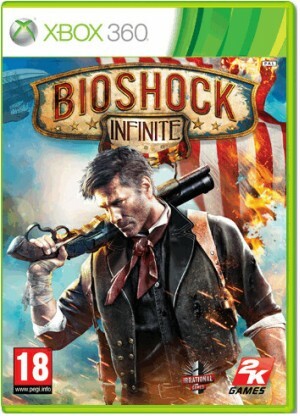 Buy Bioshock Infinite is a game where your actions have consequences, and where your very presence in the city will cause it to erupt into chaos the choices you make in you mission will have long-lasting effects. But who is Elizabeth and why has she been held captive for so long? This mysterious young girl is equal parts sweet, funny and even scary, possessing the ability to open rifts to alternate planes of existence when she sees 'tears' in the fabric of reality. These powers will come in handy as you fight your way out of the city, as she summons everything from ammo crates to health pick-ups into existence, making the environments and combat more flexible. Elizabeth can also fend off foes on her own, too!